Radio Junk Drawer started in April 2001. DP brings junk-drawer perspective each Wednesday from 3-5 pm: smart sound, garage visionaries & pop with a problem. 1 What’s so damn special about RADIO? 2 What’s a JUNK drawer? 3 Why do you inevitably talk about geography? 5 What will you NOT play on the show? 6 What’s this “voice is Virgil” business? 7 Is “Mr Smith Is in the Air” spiritual or self-evident? 8 Could you talk more, please? 9 Do you STILL believe Taylor Swift is good? 10 Will you ever stop loving Alan Vega? 11 Would you be happier if you just went and lived in Lancashire? 13 I can look at playlists of RJD shows? 14 How many people listen live on Wednesdays? Wait, how many people listen later online? 15 How do you get the extro music to end at 5 pm precisely? 16 How many turntables is enough? 17 Is the term “RJD” pretentious? 18 Will you please take it easy about Sanford? 19 Which two bands have played live on RJD? 20 Would you still love The Orielles if they were from, say, Sag Harbor? 21 Are you starting to play even more local music? 22 You don’t REALLY think Carly Rae Jepsen’s better than Palace Music do you? 24 What’s the deal with you & Bo Diddley? 25 Pop with a problem? 26 What’s the deal also with the spacing in these last few entries? 27 Wait, am I your ideal listener? Listening to Archive Apr. 5th with my AP Studio art class and they’re loving it! I’ll send you a shot of them at work if I can. Anyways, regarding Tomorrow Never Knows, a quirky phrase taken from Ringo during an interview, John found it hilarious. The replacement is from loops they each went home and experimented with. Paul along with a bunch of random other songs recorded seagulls. That’s what is most prominent. Jeff Bell, thank you SO much for listening and for writing. Thrilled that your AP Studio art class loved the show along with you! Viva la radio! Perhaps one or more of your students may be interested in listening to–or even joining–the Blunt Youth Radio program on Monday evenings. All the best to you and your students at WHS! I listened to your program on March 13th. Keep up the great work. I’m thinking you’re the Dave Pence who has (had?) a father of the same name that sold insurance. (still doing well) during the day. I just thought I’d say hello. I’m not a Facebook, or Twitter user. Paul, thank you for listening and thank you for taking the time to write. I am that David Pence, indeed, and I remember the time spent in and around your family’s house so long ago very fondly. Bless your late mom. Best, David. Thanks, Maureen–so nice of you! I appreciate your avid listening. 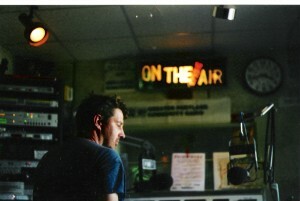 I was Music Director and a DJ at MPG back around 1987. (“Coffee and Cigarettes.”) Radio Junk Drawer sends me back to the days of spending every last cent buying vinyl and seeing bands. RJD is the freshest show in Maine. Never ever stop, Dave. Sarah, thank you so much for listening to RJD and for your generous comments! Thrilling to know there are listeners out there like you. hey David, I’ve been listening to Radio Junk Drawer for some years now when I can catch it. Ive always liked your show because of the obscure 60’s 70’s stuff you play . Really cool stuff. I;m a few years older than you (62) so I’m a huge Beatles guy. I play guitar (unrelated) a ton of Beatle material. Anyway, I streamed my first Radio Junk Drawer today and was super pleased about George’s Album. I never thought I would be able to connect with someone about the impact that had on me. I was thinking the whole time that you should play “be here now’ and sho nuff, you played it last. I cannot articulate my feeling for this album except it was extremely memorable for me..
PS. I have the guitar tablature book as well as the album of course. Great job man, hope to meet you some day maybe as we have very similar interest….